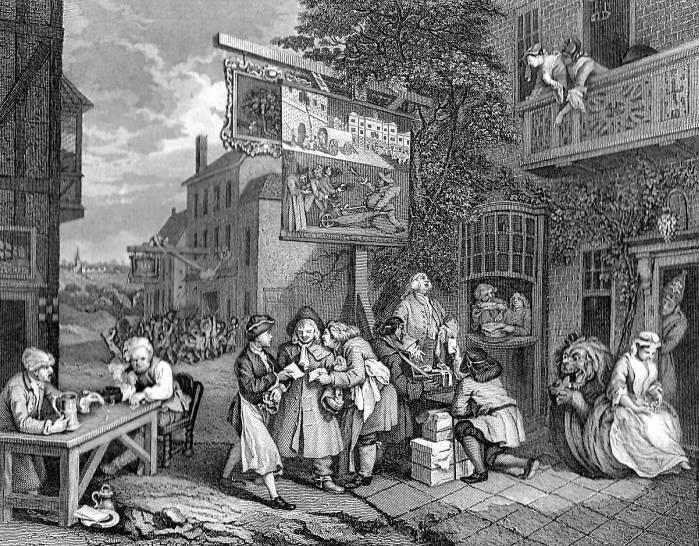 Hogarth's four paintings pillory the much vaunted electoral system, the cornerstone of the parliamentary democracy of Great Britain, by exposing such matters as party violence, bribery, and corruption in the electoral practices, especially prior to the establishment of "Election Committees" under the terms of the Grenville Act (1770). The system of eighteenth-century England, the product of the Glorious Revolution and the defenestration of absolutist King James the Second (Stuart) of 1688, was hardly based on universal suffrage. Women, of course, could not vote, but neither could the majority of British subjects. The British voter was either a "freeman" or a "burgess," each of whom could meet the property qualification of ten pounds. Vote buying was common enough: Sykes and Rumbold, for example, were fined and imprisoned for bribery during the 1696 parliamentary elections, and an elector of Durham in 1803 was fined 500 pounds. Even as late as 1840, voting irregularities compelled the authorities to declare the elections for Cambridge and Ludlow void. Complete works of William Hogarth ; in a series of one hundred and fifty superb engravings on steel, from the original pictures / with an introductory essay by James Hannay, and descriptive letterpress, by the Rev. J. Trusler and E.F. Roberts. London and New York: London Printing and Publishing Co., c.1870.